JobsinQatar is a comprehensive information site that helps you get Employment in Qatar, It provides you with insights about Qatar, its demographics, geography, quick info, top employers and major industries. If you are looking for opportunities and Jobs abroad, middle east jobs are very lucrative where you get high paying Jobs with a good saving potential. As you are aware, Middle east's economy is driven by its rich Oil and Gas reserve. So you will ideally find lots of openings for Oil and Gas Jobs and all allied industries including construction, transportation, infrastructure, telecom, consumer goods & IT. A change in Job, primarily if you are planning for overseas jobs, causes lots of anxiety. This site intends to help you find answers to some of your important questions. We wish you success in your Job search. Post your jobs and reach out to jobseekers from across the world. The most comprehensive Employment agency directory for the Middle East with over 6457 listings compiled for you! When planning to work in Qatar or other countries in the Middle east, one is always ancious to know how it is like to work there. 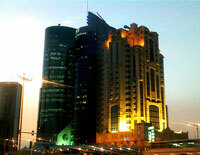 This site aims to help you learn more about Qatar. Please feel free to contact us with your suggestions to make the site more helpful. Copyrights © 2018 GotoGulf.com, All rights reserved.